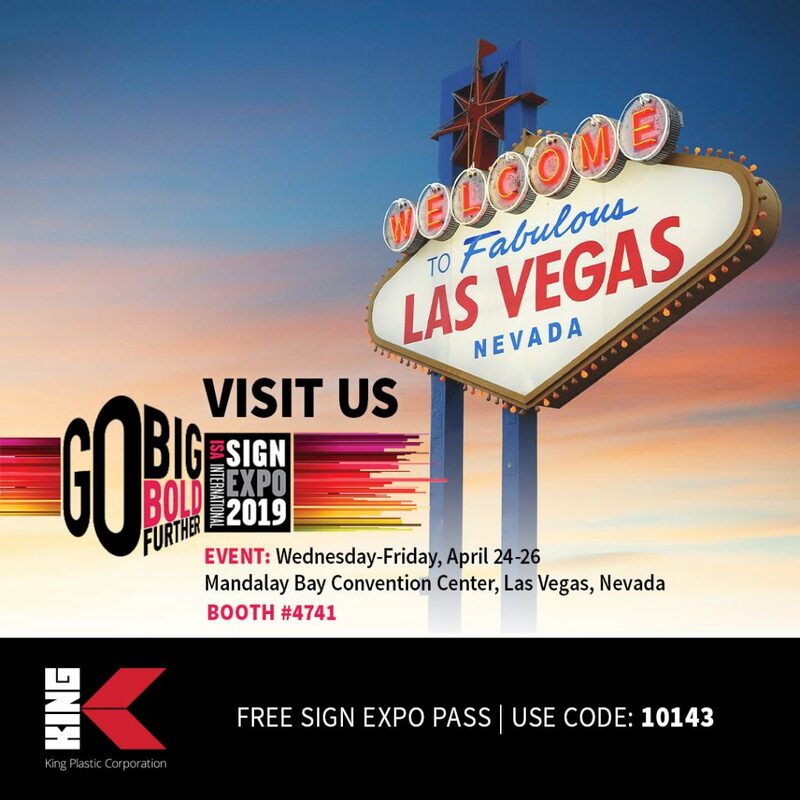 North Port, FL, April 5, 2019 – King Plastic Corporation, a leading manufacturer of polymer sheets, slabs and massive shapes will exhibit at the International Sign Expo (ISA) held April 24-26, 2019 at the Mandalay Bay Convention Center, Las Vegas, Nevada. King Plastic Corporation will showcase its popular product brands: King ColorBoard®, King ColorCore® and King StarBoard® ST. The International Sign Association (ISA) is a 2,300-member trade association. The members are manufacturers, users and suppliers of on-premise signs and other graphics products from the 50 United States and 54 countries around the world. ISA supports, promotes and improves the graphics industry, which sustains the nation’s retail, distribution, service and manufacturing industries. Free expo passes are available at www.signexpo.org using the King Plastic promo code 10143. King Plastic’s polymer sheets are developed to withstand the harshest outdoor conditions. It will not rust, delaminate, or rot when exposed to humidity or water. The polymer sheet never needs painting or refinishing, works like wood and is easy to fabricate using common woodworking tools and techniques. To learn more about King Plastic Corporation or to find a distributor, visit www.kingplastic.com. Founded in 1968, King Plastic Corporation is a leading manufacturer of quality polymer sheets, slabs and massive shapes – including several products pioneered by the company. Its polymers are sold worldwide through a network of plastics distributors and markets in marine, architectural, healthcare, signage, industrial, food service and many other markets. The company headquarters is a 250,000 square-foot manufacturing facility in North Port, FL. As Seen in Signs of the Times! 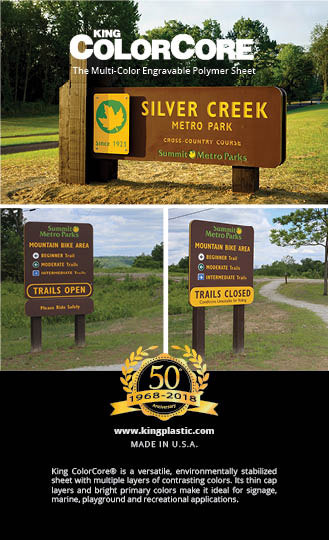 Oscar Scherer State Park trail signs are made using 3/4″ gauge 48″ x 96″ sheets of King ColorCore® in brown/white/brown color. 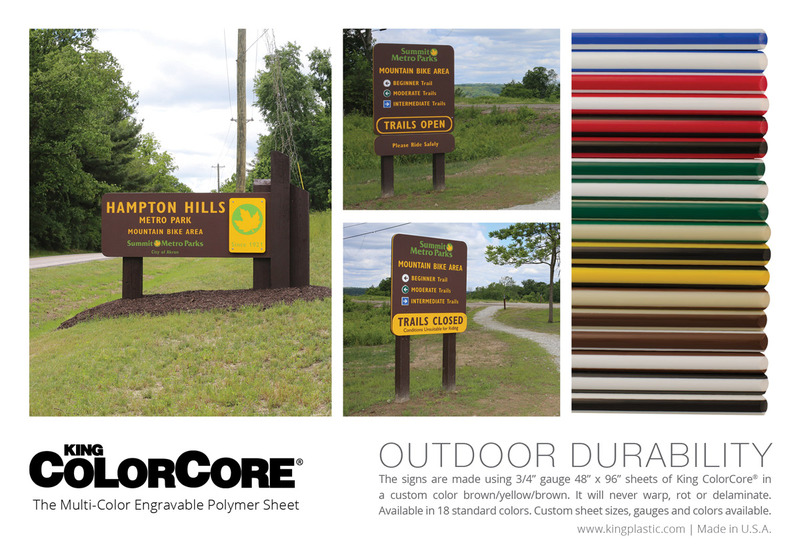 King ColorCore® is a versatile, environmentally stabilized sheet with multiple layers of contrasting colors. Its thin cap layers and bright primary colors make it ideal for signage, marine, playground and recreational applications. It will never warp, rot or delaminate. Available in 18 standard colors. Custom sheet sizes, gauges and colors available. North Port, FL, March 8, 2018 – King Plastic Corporation, a leading manufacturer of polymer sheets, slabs and massive shapes will exhibit at the International Sign Expo (ISA) held March 22-24, 2018 at the Orlando Convention Center in Orlando, FL. King Plastic Corporation will showcase its popular product brands: King ColorBoard®, King ColorCore® and King StarBoard® ST. The International Sign Association (ISA) is a 2,300-member trade association. The members are manufacturers, users and suppliers of on premise signs and other graphics products from the 50 United States and 54 countries around the world. ISA supports, promotes and improves the graphics industry, which sustains the nation’s retail, distribution, service and manufacturing industries. Free expo passes are available at www.signexpo.org using the King Plastic promo code 30224. The polymer sheets are developed to withstand the harshest outdoor conditions. They will never warp, rot, or delaminate when exposed to humidity or water. The material can be fabricated using common woodworking tools and techniques. The signs are made using 3/4″ gauge 48″ x 96″ sheets of King ColorCore® in a custom color brown/yellow/brown. It will never warp, rot or delaminate. Available in 18 standard colors. Custom sheet sizes, gauges and colors available. North Port, FL, March 1, 2017 – King Plastic Corporation, a leading manufacturer of polymer sheets, slabs and massive shapes will exhibit at the International Sign Expo (ISA) held April 20-22, 2017 at the Mandalay Bay Convention Center in Las Vegas, NV. King Plastic Corporation will showcase its popular product brands: King ColorBoard®, King ColorCore® and King StarBoard® ST.
Free expo passes are available at www.signexpo.org using the King Plastic promo code 30873. Founded in 1968, King Plastic Corporation is a leading manufacturer of quality polymer sheets, slabs and massive shapes – including several products pioneered by the company. Its polymers are sold worldwide through a network of plastics distributors and markets in marine, architectural, healthcare, signage, industrial, food service and many other markets. The company headquarters is a 150,000 square-foot manufacturing facility in North Port, FL. As Seen in Signs of Times! The outdoor sign is made using 3/4″ gauge 48″ x 96″ sheets of King ColorCore® in blue/white/blue. Each letter consists of two CNC engraved sheets, joined by a half lap joint and screwed together to produce each of the nin 8′ x 8′ letters. April 28, 2016 – King Plastic Corporation was pleased to exhibit at a record-breaking ISA Sign Expo (International Sign Association) at the Orange County Convention Center. According to signexpo.org, the 200,000 square foot trade show was attended by 20,044 people from around the globe making it the largest ISA Sign Expo in a decade and largest in Orlando, FL. King Plastic representatives enjoyed meeting show attendees and making several connections. The company displayed a golf course theme with signs made with King ColorCore®, the multi-color engravable polymer sheet. 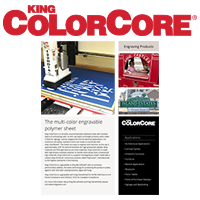 Visit the King ColorCore® page to see product application photos, fabrication and CNC tips, and videos. North Port, FL, March 14, 2016 – King Plastic Corporation, a leading manufacturer of polymer sheets, slabs and massive shapes will exhibit at the ISA International Sign Expo, April 20-23, 2016, at the Orange County Convention Center, South Building in Orlando, FL. King Plastic Corporation will showcase its popular King ColorCore®, the multi-color engravable polymer sheet, in Booth #1575. The International Sign Association is a 2,300-member trade association, the members of which are manufacturers, users and suppliers of on-premise signs and other graphics products from the 50 United States and 54 countries around the world. ISA supports, promotes and improves the graphics industry, which sustains the nation’s retail, distribution, service and manufacturing industries. 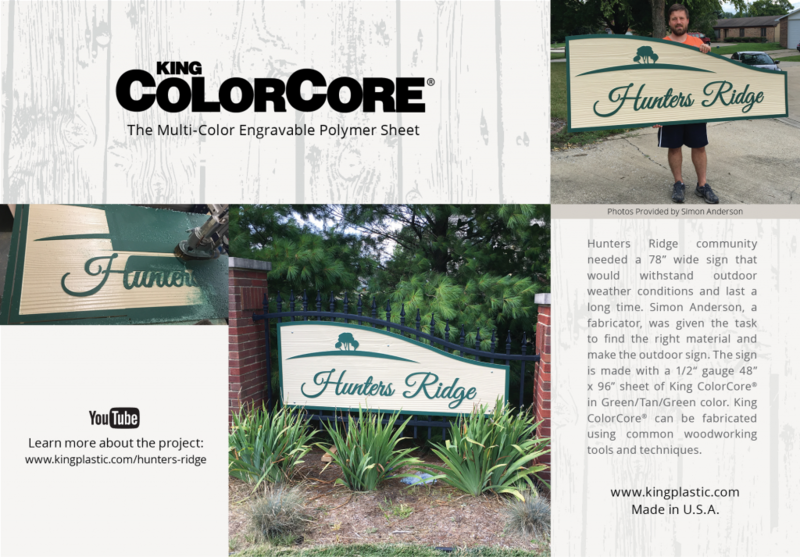 King Plastic will highlight the features and benefits of using King ColorCore for outdoor sign applications through its golf course themed booth. Attendees are encouraged to stop by the booth, attempt a hole-in-one and receive a King ColorCore golf towel. 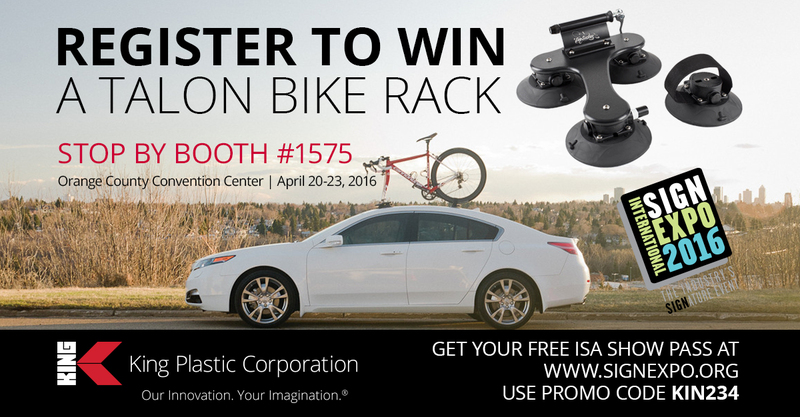 Also, register to win a Talon SeaSucker Single Bike Rack made with King ColorCore. 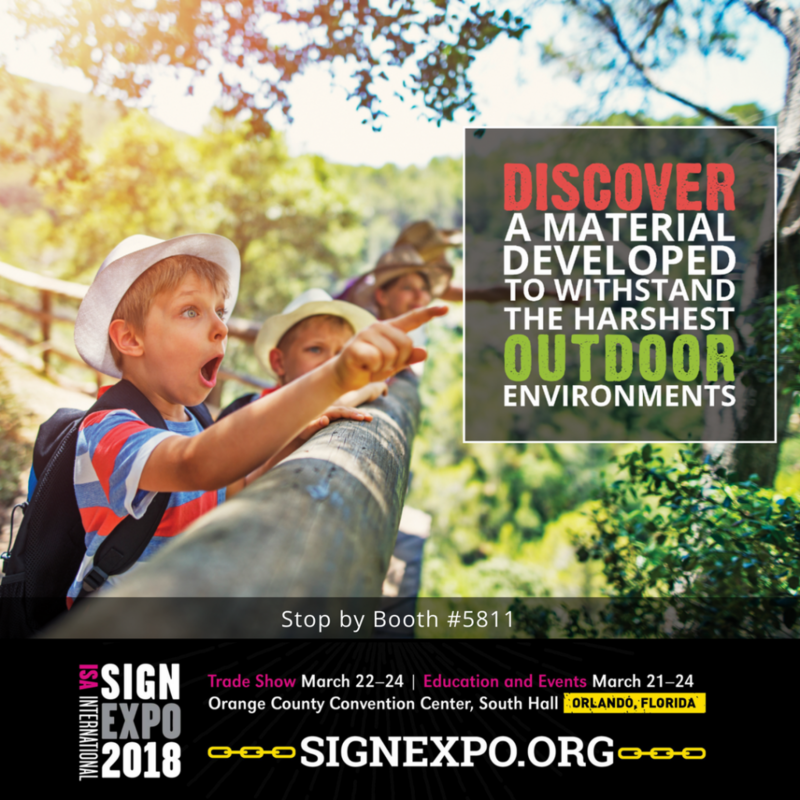 Free expo passes are available at signexpo.org using promo code KIN234. 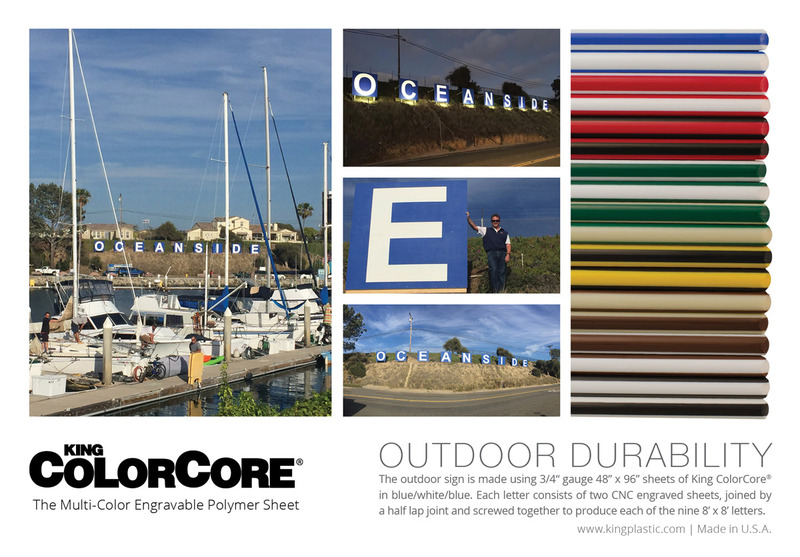 King ColorCore is a versatile, environmentally stabilized sheet with multiple layers of contrasting colors. Its thin cap layers and bright primary colors make it ideal for signage, marine, playground and recreational applications. For maximum versatility, standard colors are made to coordinate with King ColorBoard. King ColorCore is easy to engrave and machine, as the cap is approximately .050” thick. 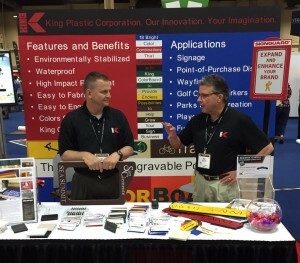 NORTH PORT, FL, April 27, 2015—King Plastic Corporation was pleased to attend another successful show at the International Sign Association (ISA) Sign Expo 2015 in Las Vegas, NV. Thousands of sign expo attendees in Las Vegas took advantage of the opportunities to network with industry colleagues, increase their industry knowledge through education and expand their product lines and capabilities on the trade show floor. Held April 9-11, 2015, the ISA Sign Expo hosted more than 600 exhibitors in 213,000 net square feet of trade show floor! King Plastic representatives enjoyed the show and made several great connections. The company featured its multi-color engravable polymer sheet, King ColorCore® as well as a complimentary product called King ColorBoard®, the colorful environmentally stabilized polymer sheet. To learn more about King Plastic Corporation, visit www.kingplastic.com. King Plastic Corporation began as a small, family enterprise. Founded in 1968, King Plastic Corporation is a leading manufacturer of quality polymer sheets, slabs and massive shapes-including several products pioneered by the company. Its polymers are sold worldwide through a network of top plastics distributors to customers who fabricate products for the Marine Industry (King StarBoard® Brand), Signage, Food Service, Healthcare, Architectural, Industrial and other Markets. The company headquarters is a 150,000 square-foot manufacturing facility in North Port, Florida. The King family still maintains independent ownership and control. The same values that made the company so successful in the past still prevail today. King Plastic Corporation pioneered the first marine-grade polymer sheet, King StarBoard®, which remains the dominant brand in the marine industry today. Since then, King has produced dozens of breakthrough products for a wide variety of industries, from food service to signage to giant slabs weighing more than 6,000 pounds. King continues to raise the bar with new products, new production techniques and new standards of excellence. 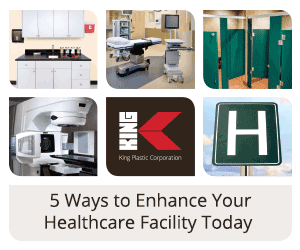 King’s commitment to quality doesn’t end with products. The company’s in-house sales team excels at product knowledge and developing long-term customer relationships. Its worldwide network of plastics distributors includes the best in the industry. Together, they make sure manufacturers and fabricators receive the right material, at the right price, right on time. Thanks to everyone who stopped by the King Plastic Booth Apr 9-11, 2015! Visit us at Booth #1009. 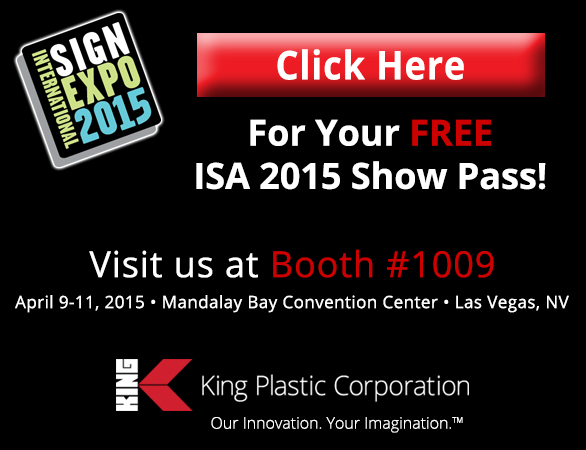 The ISA Show is April 9-11, 2015 at Mandalay Bay Convention Center, Las Vegas, NV. Architects an d designers specify King products because they fill specific needs, look beautiful and last a lifetime without rotting, delaminating or leaching into the environment. King polymer sheets work like wood and your fabricator can make our materials into nearly any application you can imagine. Signs and the information they convey have become an integral part of daily life. Companies of various sizes serve this vast market, but they all have common problems when it comes to routing of the materials common to the industry. Wood, aluminum, foam and plastic all have different cutting characteristics and no individual tool can solve all routing problems. This is particularly evident in the routing of plastics in the sign industry. As a starting point, plastics can be placed into two general categories: flexible and rigid. The tools of choice for flexible plastic usually involve the use of single or double edge “O” flute tools, which are available in straight or spiral flute configurations. In terms of rigid plastics, double edge straight “V” flute tools, spiral “O” flutes with hard plastic geometry, and two and three flute finishers are recommended. The tool materials for most of these router bits are readily available in high-speed steel for hand operations and solid carbide for CNC routing. Solid carbide is a very durable material when utilized in a controlled environment of CNC, but not reliable in hand routing, which tends to be less rigid with more opportunity for tool breakage. The aforementioned recommendations are general in nature and are just a beginning for tool selection. In order to target an application, the sign maker has a new resource on the Internet at www.plasticrouting.com. This site provides a specific tool recommendation for a variety of plastic materials. The major emphasis of this website is to recommend router tools that provide the best finish at a productive feed rate. Sign makers, who historically use smaller diameter tools to achieve the necessary radii associated with lettering, will be pleasantly surprised. The tool diameter is the controlling factor in feed rate, but larger diameters were not necessarily superior in terms of finish. The use of micrograin carbide with the necessary geometry to achieve chip evacuation has made smaller diameter tools more effective for the sign industry. The site can also be accessed via a link on IAPD’s web site at www.iapd.org. Recently, there have been several new styles of specialty tools developed to improve finishes with faster cycle times without tool changes and or advanced programming techniques. Both should prove to be advantageous to the sign industry. The first of these tools was developed to provide a smooth bottom surface in lettering or pocketing applications. Most router tools are designed to plunge and rout with the emphasis on the side geometry rather than the point. Consequently, the point end would always leave swirl marks, which required a secondary operation to remove the swirls. The new tool (Figure 1) utilizes a near flat point with radiused corners to create a smooth bottom with an aesthetically pleasing result. 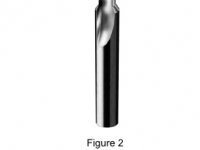 The second innovation (Figure 2) is the development of a rout and chamfer bit designed for plastic sheets. 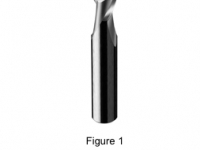 By combining both a straight flute optimized for cutting plastics with a cutting edge sized for specific sheet sizes and a 45 degree chamfer edge, these tools can rout out plastic parts and apply a variable depth edge chamfer in a single pass. By combining these features into a single tool, tool changes within the machining cycle are eliminated and CNC routers without tool changing spindles have new capabilities for parts production. The advances in router tooling have generally followed the rapid growth and usage of CNC routers or router tables as they are commonly called in the sign industry. These machines have revolutionized the speed and accuracy of sign making and the ability to produce intricate shapes and designs with specialized software. Router tooling has enhanced the CNC user by providing stronger tools with improved cutting geometry specific to the material being machined. However, merely choosing the correct tool without effective machining practices is an exercise in futility. Consequently, a review of proper machining practices would be in order. Maximize dust collection to completely evacuate gummy chips produced by some plastics The right tool for the job and sound CNC machining practices will improve throughput, product quality and profitability in the sign industry.